The new award winning steering effort sensor CLS-E sets new standards in size of the housing as well as in resolution and accuracy of the measurement data. Due to its extreme miniaturization the sensor can be integrated in most standard vehicles replacing the air bag directly in the original steering wheel. 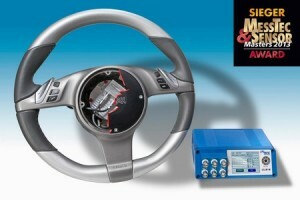 All other functions of the standard steering wheel are completely preserved. Beside torque, steering angle and rotational velocity the sensor optionally also acquires the accelerations in the centre of the steering column in x-, y-and z direction as well as the rotational acceleration. All measuring dimensions are converted with 16 bit resolution (internally: 24 bit) and will be transfered failure-free. The accuracy of the torque is about 0.1%. The contactless power supply is by means of induction. The receiver and control unit offers analogue outputs and digital interfaces (CAN, Ethernet) suitable for any application. An OLED display is integrated in the receiver unit where you can see all measuring values in physical dimensions. In combination with the RemusLAB software tool you can control the unit and acquire data in the most convenient way.